Do you love the great outdoors and have been itching to get away from work and do some soul searching? We are too. So, just to keep your morale high, we thought it best to give you the best forts in Maharashtra, perfect for trekking that are sure to give you that break you've been looking for. Karnala Fort, nestled in Karnala Bird Sanctuary is a beginner’s level trek just 10 km away from Panvel. Which means that you’ll only need a day to do this. If walking for you only means going around malls, but you’ve been envious of those who sport their sneakers and boast of clicking mountain top selfies, this is a good trek to start with. Peth Fort or Kothaligad is a 5.6 km trek (around 3 hours) that starts from the Ambivali village and ends at the pinnacle of the fort. The route, scenic throughout, leads straight up to the watchtower, which if visited in monsoon is mostly covered with clouds. Used interchangeably by the Marathas and the British throughout the 19th century for vigilance, the climb is steep but so picturesque that it will instantly rid you of all the tiredness. Plus, with the height, it's perfect if you're hankering for some cool breeze. Mostly derived from Jazeera, an Arabic word that means an island, Janjira Fort is surrounded by water on all four side and is, therefore, also called the island fort. Once you manage to trek to the top of this fort, there’s a lot of history that the fort reflects. One of the best forts in Maharashtra, Janijra is famous for its invincibility, the one monument that even King Shivaji could not lay his hands on. History buffs, here's your jewel. 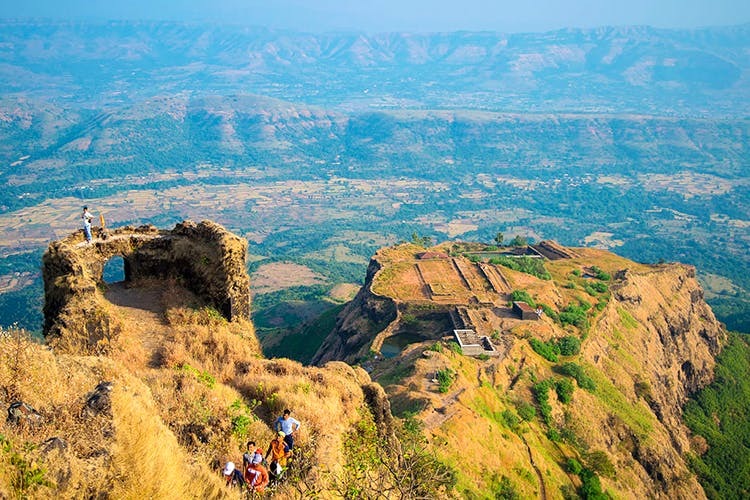 Situated near Pune, Rajgad Fort – as the name suggests – is the king of all forts. While it is an architectural marvel from Chhatrapati Shivaji’s kitty, it also makes for a challenging trek. The lush green Sahyadri range is a mesmerising view as you ascend the steep terrains tackling narrow paths, double-walled shield fortifications and hidden doors. If you’re up for an early morning adventure, don’t forget to soak in the sunrise from Balekilla. 30 km from Ratnagiri, Purnagad is a sea fort that is believed to be Shivaji Maharaj’s last phase of development, hence the name (Purna meaning complete + gad meaning fort). A one day trek, this is a comparatively short trek, about 15 minutes long, leading up to top where you’ll enter through the western gate, further reaching the eastern gate that opens towards the sea. Some popular selfie points? With the idol of Lord Hanuman right at the entrance, with the ancient carvings, and other walls that are pretty much in great shape.